Click the photo for a gallery of shots from the East High reception and show of Brendon "SOLVE" Scanlon's artwork, courtesy qtouch. 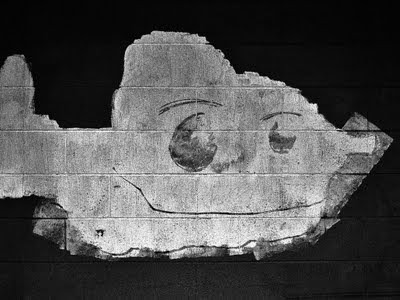 This mural, on the back wall of O'Keeffe Middle School on Madison's near east side, was originally painted in 1992 and apparently touched up in 2002 by students with the help of art teachers. It's always been a favorite of mine, living in the 'hood as I do. It's just so cheery! According to photographer >Elab'rãt>'s description, though, "To understand some of the imagery in the mural, it is important to know that in 1832, during the so-called "Blackhawk War," the Native American leader Blackhawk and his people camped in the Madison area and then crossed the Yahara [River] near where the School is located today while they were being pursued by federal troops. That pursuit ended in far western Wisconsin on the Mississippi River south of La Crosse when the troops caught up with Blackhawk and his people and ruthlessly murdered a large number of them, including children." 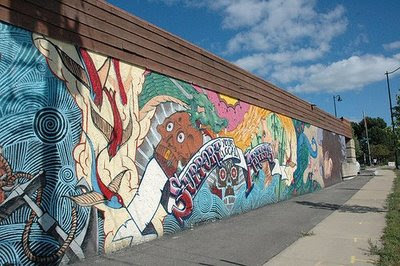 The mural is, obviously, a depiction of / wish for better times. 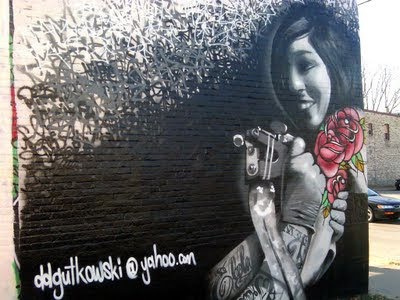 This is the current mural on the graffiti wall over at Mother Fool's, and I have to say, it's absolutely stunning. I'm fairly certain I've seen work by this artist around before--it's a distinctive style--and it's all been just as good. 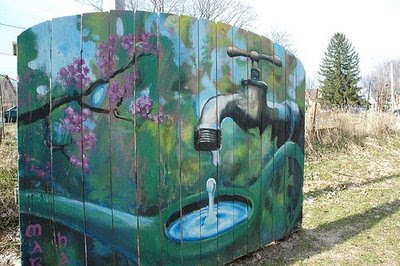 I'm always amazed at the different technqiues and levels of detail that some folks can reach with the spray can. I love it when people make my job easier. Such is the case with photographer Peter Patau, who sent in this submission today, taken in the alley behind Riley's Wines of the World. Seems an appropriate find for this haunted time of year. Vilas Hall, on the UW-Madison campus, does seem to attract an inordinate amount of stenciling. Whatever the reason, it provides for some fun double-takes whenever you walk through its outdoor corridors. This series of shots comes to us courtesy of C & V, who say they love this blog. Well, this blog loves them right back! And all of our other readers and contributors. You make things a little easier when I don't have time to go out and grab photos on my own, and for that I'm very thankful. 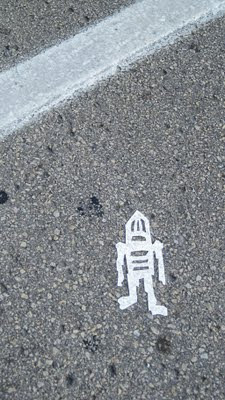 Literal street art! This Sunday, Madison held its first annual "Ride the Drive" event, wherein 6 miles of downtown roads were shut down to all but bike and pedestrian access. 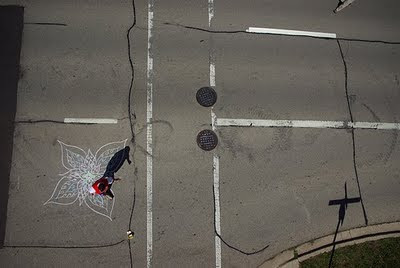 There were a lot of kids and adults out doing chalk art on the suddenly accessible streets, too, and the above shot was snapped by intrepid kite aerial photographer Craig Wilson. Doesn't jogging mess up his hair? Looks like disgraced ex-Illinois governor Rod Blagojevich has been hiding out in Madison - this, apparently, in the middle of his attempts to cash in on noteriety by appearing on various reality TV shows and hiring himself out as a terrible Elvis impersonator. He should really look where he's going. Photo by USB. This little guy glared up at me from the pavement near the capitol square, at the corner of W. Main and S. Fairchild streets, as I was headed to a gig at The Frequency. There wasn't enough time (for obvious reasons of personal safety) to get close enough to figure out if he was made of the same stuff as the crosswalk, but it looked awfully similar. Clever work, regardless. 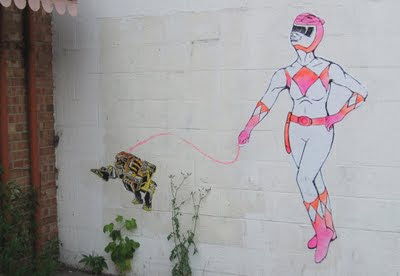 Takes the term "street art" to a whole new, and far more literal, level. I spotted this while on my commute home from work last Friday. The Pink Ranger has sadly already been removed (I think it was just a paste-up), but the little transformer guy is still there, keeping watch. This was on a wall where Escape Java Joint used to be on Williamson St. One of the bigger and more whimsical pieces I've seen in awhile. 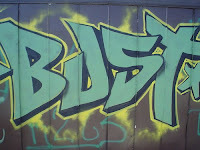 This rather nice photo comes to us courtesy of Peter Patau, a fine local photographer and budding street art spotter. The piece looks to be done on a train car on the tracks along the southwest bike path, so it may just be passing through town. 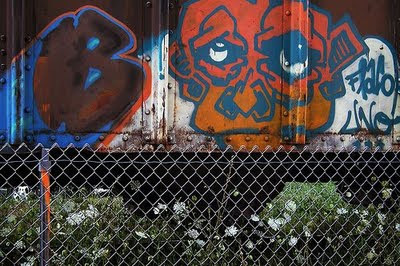 I know graffiti on trains is as highly illegal as anything, but I must admit that I enjoy the added color. There must be a certain thrill for the artist, too, knowing that their work will travel from place to place and be seen by people across the country. 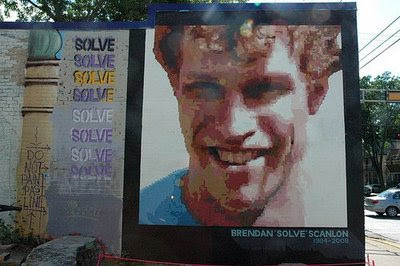 [Brendan] Scanlon, a Madison native, was a Chicago-based muralist who went by the alias "SOLVE." He was killed last summer, stabbed in an alley at age 24. 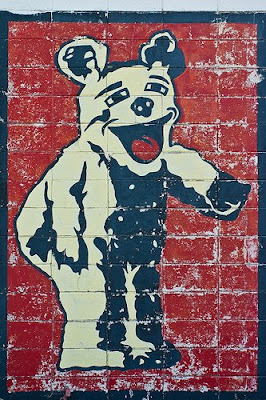 Now, a tribute to his street art lines the Playhouse Gallery hallways in the basement of Overture. It sounds like a great show, representing both SOLVE and many of the artists who respected and were touched by his art in some way. And I admit to being a little pleasantly surprised that this is being housed by the Overture, which tends to lean more heavily toward gallery art and artists (which, contrary to certain other local bloggers' beliefs, I also enjoy). It's good to see them branching out and offering space to the kind of art you'd usually only see under a freeway or some other outdoor surface. You can check it out until Sept. 16th at the Overture Center in downtown Madison. Spotted and shot by the intrepid beinshitty. I really dig this piece. It almost looks vintage, but the colors are still bright. Also delightfully weird. I'm not entirely sure of the medium. The sign was pretty dirty, so maybe the mask makes sense. 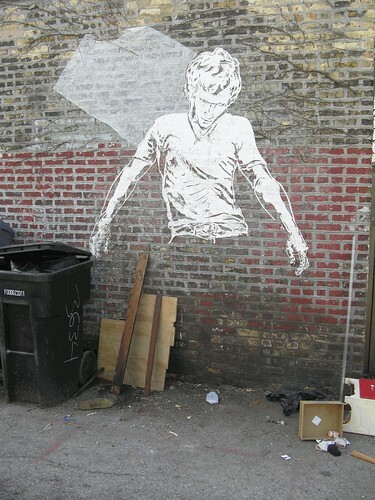 Found along Jenifer St.
Found painted on the side of Africana Restaurant, 2701 Atwood Ave. I hear the fufu is quite good. 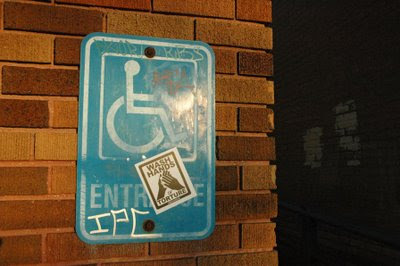 Intrepid on-the-ground reporter DW sends in this snapshot of a particularly feisty sticker/paste-up on the corner of Gorham St. and Fordem Ave. on the city's northeast-ish side. Is that angry man someone in particular? I don't recognize him. 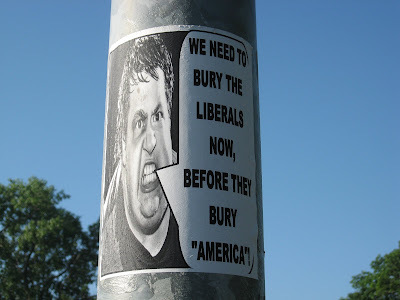 But I like how "America" is in quotes. 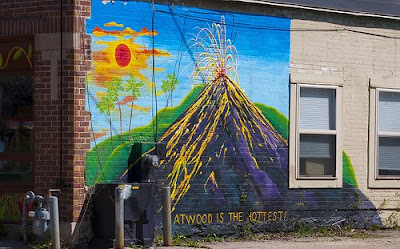 One of our city's most vibrant and visible pieces of street art (and the masthead for this blog) has officially been slated for demolition. The mural on the side of Tranquil Tattoos (1900 E. Washington Ave., on the corner with First St.) will turn to dust once the "Emerson East" project goes in. The project, to include housing, retail, and underground parking space, was just approved by the city's Plan Commission. I know perfectly well that art, like most things, is transitory in nature. We can't expect to hold onto it forever. Good Buddhist monks would shake their heads at us to think otherwise. 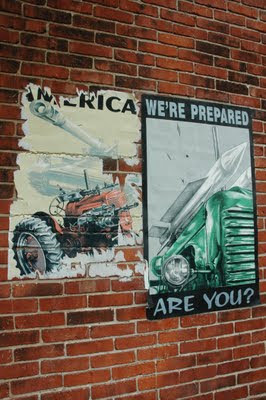 But it's still sad to see one of the few great examples of mural work in Madison relegated to the rubble heap. We have so few places open to letting artists do their work on their walls, so the loss of even one is felt all the more acutely. And for that, I shake my head. I wandered out into the golden light of early evening this past Friday in order to check out some of what was on offer for Gallery Night, when Madison's artists throw open the doors of their musty studios and allow the public to wander through and check out their wares. It's a fantastic idea, and the crowds of people that can be seen walking from place to place are a testament to the events popularity. I'm all for anything that makes art more accessible to everyone. While I was out, I came across this sticker--apropos especially because of the current debate over our country's use of torture. The piece is by Gitmo Jesus, (aka P.S. Mueller) a staple here on the near east side and Madison at large. 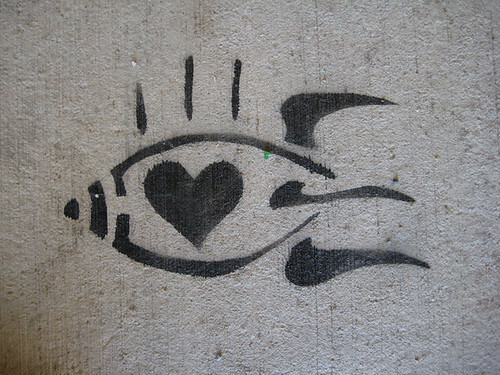 The flowers are beginning to bloom, grass is greening, and celestial love is in the air and on the streets. 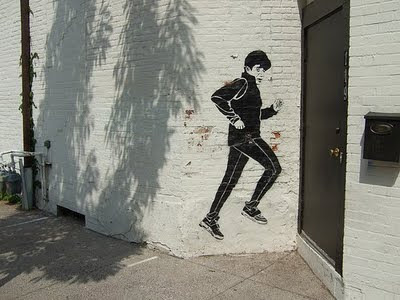 Photo courtesy of Olive, our bicycle-bound, street art hunting gal about town. Spring, slowly--cannot come fast enough. Finally got out on a photo walk/art hunt last weekend. More to come. 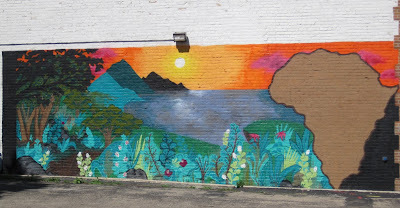 This painting/mural is a permanent feature on the bike path near the Atwood neighborhood's community gardens. 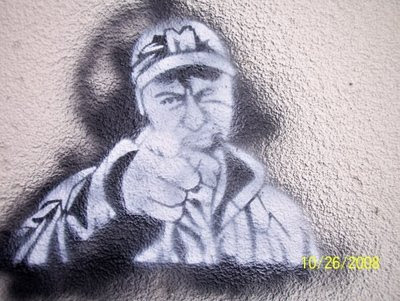 Looks like the MPD is "cracking down" on graffiti in the city, especially on the north side. They've gone so far as to release a summary police report on 8 recent arrests. 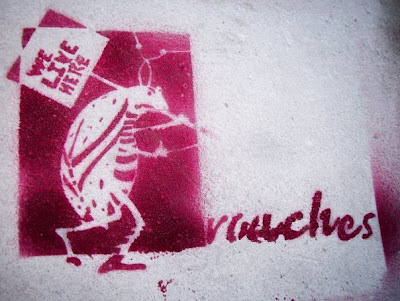 The report also trumpets "Graffiti is a 'quality of life' crime the MPD will continue to focus on. It is hoped these arrests will serve as a deterrent to others." Thing is, I'm actually against the stupid, scrawled tagging style of graffiti (the stuff that any joker with a paint pen or permanent marker could make). My take is that they're pointless, obnoxious, ugly, and give a bad name to the kind of street art we should be encouraging--ie: the kind of stuff I try to post here. If we want to make real progress in convincing the crotchety official types to allow for more public art space, one of the things we have to do is make some effort to cut down on tagging that actually damages property. There are a lot of negative, misinformed attitudes to overcome, and we need all the high ground possible to do that. At least, I think so. Feel free to argue a different point. And be sure to stay alert while you're out there, kids. The MPD is on the we've-totally-got-our-priorities-in-the-right-place prowl. Even in the midst of so much snow and ice, street art connoisseurs are out looking for new work to admire. 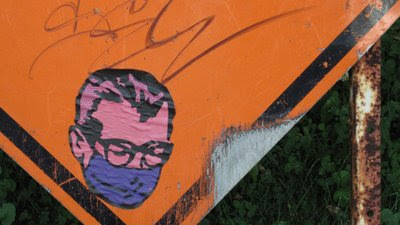 Tipster A. sent in this shot of a stencil found at North Webster and E. Dayton. He was also kind enough to send along word of several other art sightings, and I'm hoping to hit the pavement soon to search out some of them on my own. 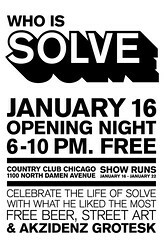 Word on the grapevine has it that there's a SOLVE show in Chicago this weekend. 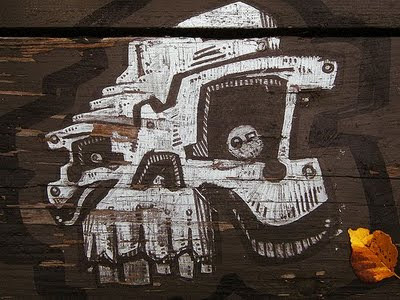 SOLVE was a Chicago-based graffiti artist originally from Madison who was killed last year, spurring a whole slew of tribute work across town. 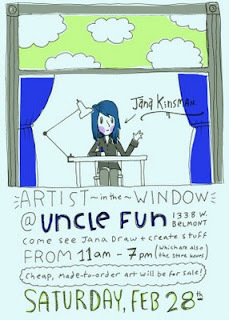 If you're a fan of the medium, the artist, or just a curious onlooker and find yourself in the area come January 16th, be sure to check this out. Thanks to tipster Q for the heads up.